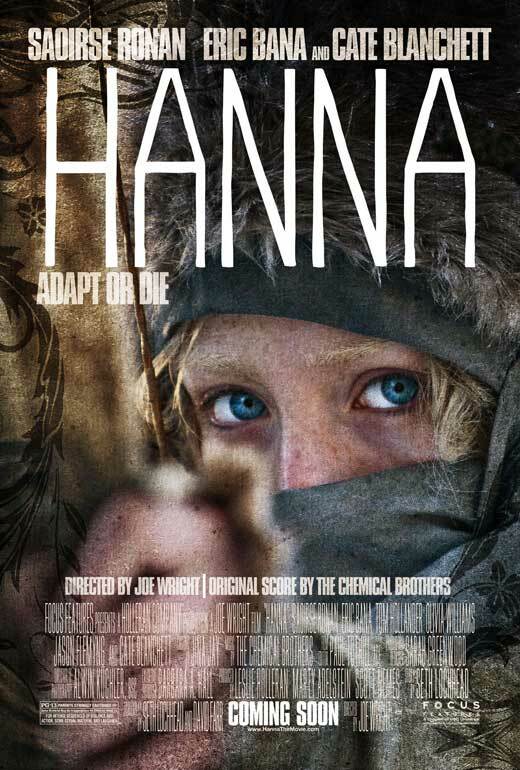 A young girl Hanna (Saoirse Ronan) lives in the wilderness of Finland with her father (Eric Bana) most of her life training to be the perfect assassin. When the time becomes right her and her father, reenter the world, to extract revenge for the death of her mother. Their Target is Marissa (Cate Blanchett) who works for a government agency and killed Hanna’s mother. Hanna has to enter the world after extreme isolation, where she knew no one but her father and didn’t even have any electricity, so really she is seeing the rest of the world for the first time. But hard on her trail is Marissa, who is trying to capture Hanna, before Hanna can kill her. So I am still sitting here processing this movie. I liked it, but I’m not sure how much I liked it. If that makes any sense… I went to this movie having only a very small idea of what it was about, I hadn’t seen any previews, I had just read the little blurb on Harkins movie descriptions, so I had no preconceived notions about what this movie should be like. So it has the feel of a Bourne movie, but this is no Bourne movie. The action sequences were interesting in that the assassin is a teenage girl that does not look like she can take down a 200 lb man but does with ease. The action scenes themselves were not always very well choreographed and looked a little forced, but they were still enjoyable none the less. What I really found intriguing about the movie is seeing the world for the first time through Hanna’s eyes. She had never even seen a car before, or had electricity so she has to adapt to the outside world and fast. I remember thinking during the movie that not much happens, but I was in no way bored. Marissa, you never really get a handle on, except that she is pretty creepy. I never really knew if she was trying to kill the Hanna or protect Hanna is some misguided tragic capacity. The way the movie ended makes you think that they are planning on a Hanna 2, which if they do, I’ll probably watch it. Go see it, during matinee prices.